I have an ice cream problem. (I don’t want to know how many quarts I consume annually, but I’m sure it's on the far right side of the bell curve). You’d think my habit might slow down in the winter, but alas, snowstorms make matters worse – the snow reminds me of iced milk and melting custard. So while others were stirring chili and sipping cocoa as “Snowmageddon” hit New York City three days ago, our post-sledding warm-up involved squeezing ice cream between cookies. 1. Preheat the oven to 350°F. Grease two baking sheets with butter. 2. In a medium bowl, combine the chocolates and butter. Create a double boiler by filling a medium pot that will hold the bowl of chocolate snuggly with 1 inch of water. (The bowl should not touch the water.) Bring the water to a boil, then lower the heat so the water is hot but not boiling. Set the bowl of chocolates and butter on the pot, stirring often with a rubber spatula, until melted. Remove from the heat. 3. In the bowl of an electric mixer fitted with a whisk attachment, beat the egg on high until fluffy, about 1 minute. Add the sugar and vanilla and beat on high until the mixture thickens slightly and turns pale yellow, about 5 minutes. (Stop to scrape down the sides of the bowl.) 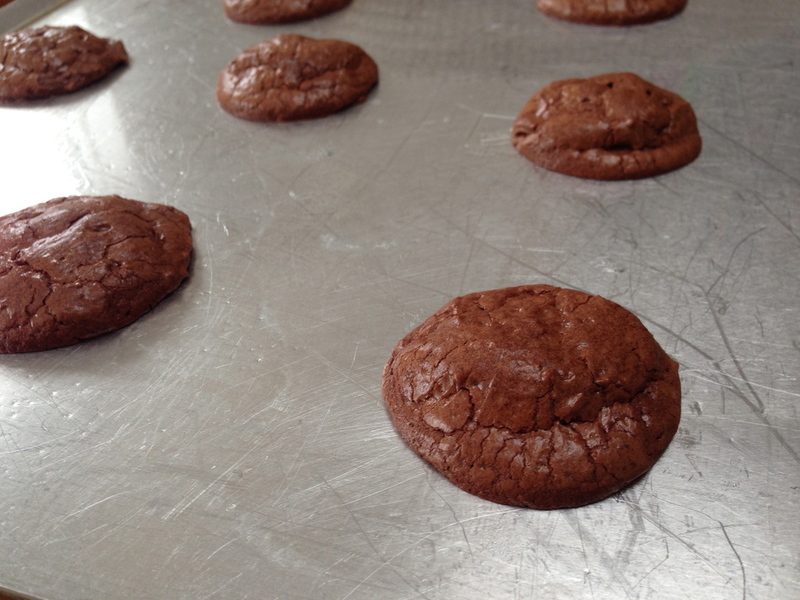 Using a rubber spatula, gently mix in the chocolate mixture. Sift the flour, baking powder, and salt together. Slowly add the flour mixture to the chocolate mixture and stir until combined. 5. Scoop 3 tablespoons of ice cream and press into a fairly round 1-inch-thick puck. 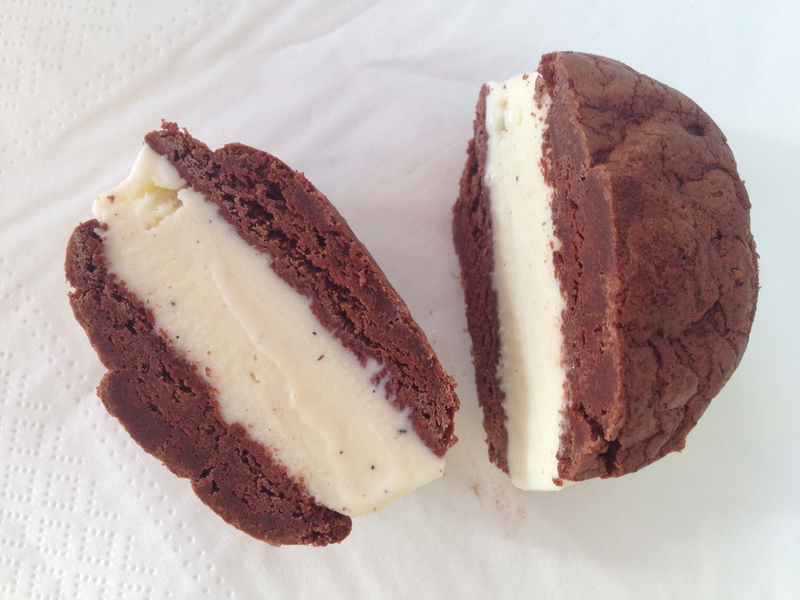 Sandwich the ice cream puck between 2 cookies and press gently until the ice cream is about ¾ inch thick. Eat immediately or wrap and freeze until ready to eat. Repeat with the remaining cookies and ice cream. Makes about 10 mini (2-inch) sandwiches. Adapted from “Old School Comfort Food” by Alex Guarnaschelli.